In Berlin I don't have a reasonable opportunity for erecting antennas. For shortwave two 15m long wires hang 8m above the ground behind the house with its four floors. The vertical for 2m and 70cm is not placed optimal at the balcony of the first floor too. 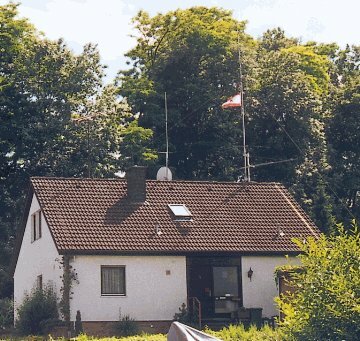 So I decided to upgrade my portable QTH near Heidelberg. On the right mast is the vertical for shortwave, below it a yagi for packet radio and an optional 37m long wire antenna. On the mast in the middle is a vertical for 2m/70cm/23cm and a satellite dish for the TV sats Astra and Eutelsat. On the left side a rusty TV antenna has survived, so there now are three antenna masts on top of the building. Detailed view of the antenna base, the lightning protectors from Hofi are located under the grey PVC cover. By the way, the ventilation tiles are well suited as a cable feedthrough after some treatment. From there four Aircom cables are going to a junction box in the wall of the upper floor, besides that a balanced transmission line, an empty tube for additional cables and a grounding wire. The sockets normally are hidden behind a small door in the wall for optical reasons. For shortwave I opted for a R7 (40m to 10m incl. WARC). 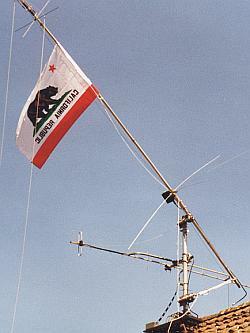 On the bottom a 19 element yagi for 70cm was mounted on a boom. With it I can work via the 9k6 digi 50 miles away without any problems. Also a 37m longwire ends at that mast and will be fed through the open wire. The mast for the R7 consists of two parts. On the roof stands a 60mm aluminum tube with 5mm wall thickness. Parallel to this, via two traverses, another 40mm aluminum tube was mounted which supports the R7 on its top. On the one side the R7 cannot be fixed directly on a 60mm tube, on the other side I gain the possibility to fold over the antenna mast. 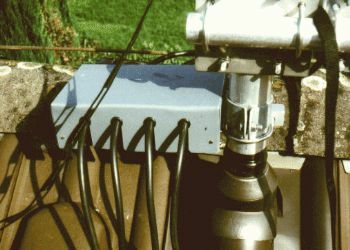 After loosening the upper traverse can be used as a bearing, at the bottom the 40mm mast will be disconnected and serves as a lever arm. 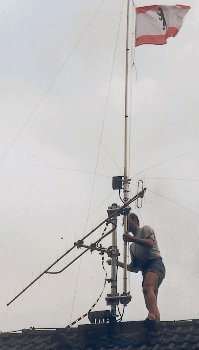 With this construction I was able to erect the whole antenna without any help even with its height of nearly 9 meters. Two eyes were added, and now with a pulley block the fold over of the antenna is mere child's play.